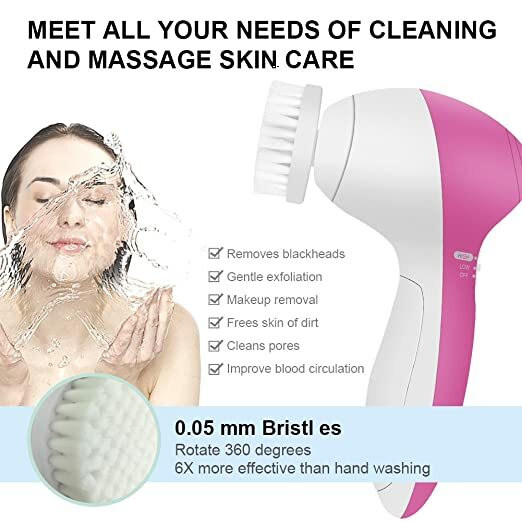 ♣ 5 IN 1 FACIAL CARE SYSTEM: Five full range brushes meet all your needs of cleaning and massage skin care. All heads can rotate 360 degrees. NYLON BRUSH: Thoroughly clean the adhesion of dirt on the face. Makeup SPONGE: Super effective at removing stubborn makeup. LATEX SOFT SPONGES: Eye and cheek message. 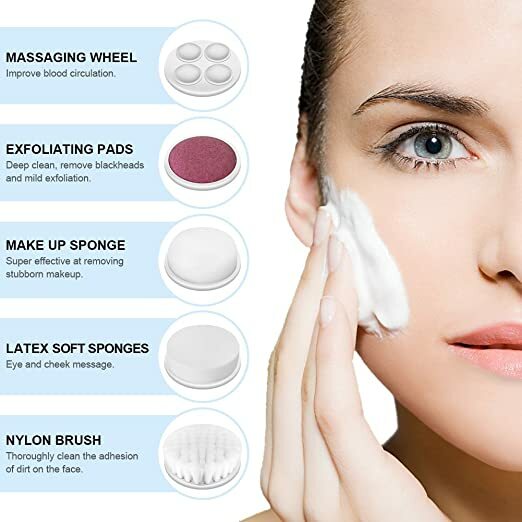 EXFOLIATING PADS: Deep clean, remove blackheads and mild exfoliation. MASSAGING WHEEL: Improve blood circulation. 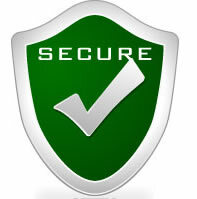 ♣ TWO-SPEED SETTINGS: Lower speed is gentle enough to use as a daily cleansing. Suitable for sensitive skin. The High speed to vigorous deep-cleaning to reduce the appearance of blackheads, experience better exfoliation and stimulate collagen growth. Suitable for the normal or abrasive skin. ♣ CORDLESS & EASY TO USE: You would not be troubled by cables, because it powers by 2 x AA batteries (not included). Size: 5.5 x 1.5 x 3.5 in. Only 5.5 inches long and light in weight, so it takes up little room in your bag You can enjoy spa-quality facial care in your own home and even while you travel. You can use it with any facial cleanser or essential oils. 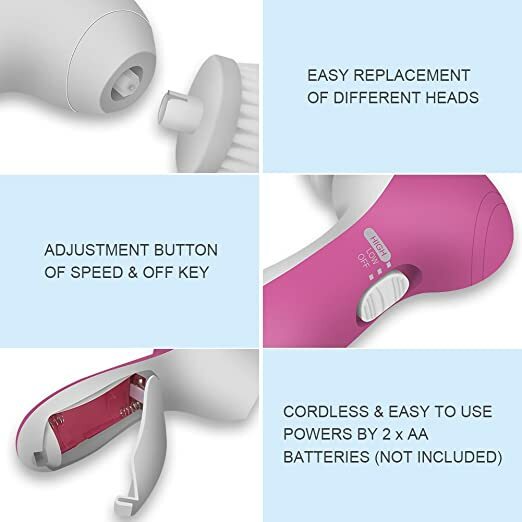 ♣ SAFE USE: FlatLED Facial Brush is made of Safe and environmentally friendly ABS material. Not changeful form, high temperature resistant, do not harm the Skin. NOTE: Operation condition: Temperature 10-40’C (50-104’F), Humidity 30%-90%. This device is not 100% water resistant, please gently clean the device with a wet/dry cloth or tissue after each use. Flush and clean the brushes head with water after each use.